Policy debates around participation in multilateral information-sharing mechanisms highlight fundamental tensions within nuclear-armed states dealing with safety, national security, and international security. Assuring other states that fissile materials are securely managed against the global threats of illicit horizontal proliferation and nuclear terrorism is a widely recognized priority. [iv] Yet, there are compelling political, safety, and security incentives for nuclear-armed states to keep information about their fissile material stocks secret. In South Asia, these tensions are compounded by the unique histories of nuclear programs in India and Pakistan and their partial participation in global nuclear governance. For India, participation in INFCIRC/549 would entail publicly declaring Pu stocks in its civilian nuclear facilities already under IAEA safeguards. For Pakistan, following China’s lead, participation could be as simple as declaring null civilian Pu stocks. Participation by both states would lend credibility to the forum—in which India’s absence has become conspicuous due to its growing civilian Pu stocks—as a multilateral mechanism for promoting global nuclear-materials security. For India and Pakistan, participation would admit them into another forum along with every other major nuclear-armed state and key states with nuclear-energy programs—strengthening both countries’ nuclear-security credentials. All three of these incentives apply to India and Pakistan in the case of INFCIRC/549. Together with current participants in INFCIRC/549, both states share concern over and have a demonstrated commitment to global nuclear-materials security. Public material accounting could help the international community prevent and prepare for the possible management of nuclear terrorism. Additional participation in multilateral nuclear CBMs could help bolster both states’ nonproliferation credentials for application to the Nuclear Suppliers Group (NSG). Participation would add another piece of evidence to demonstrate responsible nuclear stewardship. The benefits of participating in INFCIRC/549 reporting have few, if any, costs for both states. Pakistan has very little civilian Pu to report at present, but stands to gain through participation. Initially, Pakistan could participate by declaring zero separated civilian Pu as China did until 2011, after its Jiuquan reprocessing facility began operating. Pakistan could gain additional credit by reporting on civilian HEU stockpiles, as the United Kingdom does. Pakistani participation, and reaffirmation of its commitment to maintaining a civil-military divide in its nuclear activities, is particularly important in light of its plans for an expanded civilian nuclear energy program and technological capacity to pursue civilian reprocessing. [xii] Pakistan’s civil nuclear energy program continues to grow to meet high domestic energy demands, reportedly commissioning new Chinese reactors and mining cooperation. New participation in existing multilateral CBMs on nuclear-materials management would emphasize its commitment to global nuclear security and bolster its reputation as a responsible, growing nuclear-energy power. India might report its estimated 400kg of safeguarded civilian Pu. Although it has no near-term interest in declaring its technologically sensitive, strategic reserve nuclear stocks or in putting them under international safeguards, voluntarily and publicly declaring already safeguarded Pu would be a good-faith demonstration of India’s commitment to a civil-military divide between peaceful pursuits of nuclear energy and its nuclear-weapons program. The fact that all of India’s current and possible future nuclear energy partners participate in INFICR/549 declarations gives this mechanism a normative status for nuclear energy powers. (A notable exception, besides India and Pakistan, is the Republic of Korea, which might also be encouraged to participate). Overall, trade-related confidence building was a core element of INFCIRC/549 from the beginning. One notable accomplishment of the mechanism was that some participating states “did make new pledges concerning international transfers of plutonium covered by the Guidelines.”[xiii] These new commitments established an international system for responsibly tracking shipment of separated plutonium between supplying and receiving governments. India’s future plans for nuclear commerce could benefit from participation in this more practical and normative aspect of the Guidelines. Finally, the long-term value of INFCIRC/549 and South Asian participation is rooted in its function as an invitation for additional confidence building. It can serve as a baseline for communication beyond simple declarations. Participating states have met periodically in the past and might do so more frequently. Developing mechanisms, bureaucratic systems, relationships, and channels for sharing sensitive information is critical for normalizing shared management principles and building lasting confidence on international fissile-material management. Admittedly, there are problems of asymmetry with this proposal. India’s fissile material stockpile is much larger than Pakistan’s. It has a large and technically advanced civil nuclear energy program, and it has received special waivers to engage in nuclear trade. Pakistan has no separated civil Pu, but has small quantities of Pu in spent fuel and declared plans for significant expansion of its nuclear energy program. [xiv] The flexibility of participation in INFCIRC/549 reporting—as demonstrated by current participating states, from Switzerland to the United States—is malleable enough to absorb this asymmetry. Plutonium will continue to be handled in accordance with the Government of […]'s obligations under the Treaty on the Non-Proliferation of Nuclear Weapons, [(Belgium), (Germany), (France), (UK) its obligations under the Euratom Treaty], its Safeguards Agreement(s) with the IAEA, and its other nuclear non-proliferation commitments. […] and contribute to the achievement of the Principles and Objectives for Nuclear Non-proliferation and Disarmament adopted at the Review and Extension Conference of the Parties to the NPT in New York in May 1995. A third potential hurdle is political fatigue in India after concerted attempts to gain membership to the NSG. Some argue that the international community keeps changing the goalposts on India for normative acceptance into the global nuclear order. Even from this perspective, however, the primary remaining hurdle for Indian admittance to the NSG is China’s presumed veto. While waiting for this problem to be sorted, India could continue to build its case to demonstrate its commitment to responsible stewardship and nuclear security. This could help preempt criticism that Indian cooperation on nuclear security is transactional and give fence-sitting NSG members a rebuttal to Chinese concerns. The same principles broadly hold true for Pakistan, whose case for the NSG might be boiled down to arguments over equal treatment with India and rules-based criteria for NSG admittance. If India participates in INFCIRC/549, Pakistan’s case for equal treatment with its South Asian neighbor would be bolstered by also joining. Conversely, if India does not engage—particularly after past attempts by participating states in INFCIRC/549 to galvanize Indian participation—Pakistan’s choice to do so would be an even stronger gesture. An additional potential hurdle to South Asian participation in INFCIRC/549 reporting is the argument that joining another voluntary multilateral mechanism without verification is a meaningless gesture, particularly if NSG membership remains remote. A state can misrepresent information about its stockpiles, sending false messages about responsible Pu management and the directions of its nuclear programs. While this risk is entirely real, it is a weakness shared with all early-stage nuclear confidence-building initiatives. This is all the more true due to INFCIRC/549’s multilateral nature. False declarations cannot be prevented, but they would not help a nation’s attempt to be viewed as a responsible steward if they are widely suspect. The Nuclear Security Summits (NSS) from 2010 to 2014 demonstrated the productive potential of beginning with a multilateral forum to declare shared principles and concerns over nuclear security and then building from there with voluntary, tailored state-by-state offerings. Continued participation by China, France, Russia, the United Kingdom, and the United States testifies against any lingering concerns over sharing such limited nuclear information that India or Pakistan may have related to security, sovereignty, or proprietary technology. Like these powers, India and Pakistan now have mature nuclear programs with sophisticated weapons delivery systems and closed fuel cycles. True voluntary declarations under INFCIRC/549 pose no threat. A final potential hurdle is that any benefits from participation in INFCIRC/549 would be redundant as the relevant Indian and Pakistani civilian nuclear facilities are already under IAEA safeguards. This overlap is an advantage, not a hindrance. Publicly declaring estimates of Pu stocks—beyond privately submitting them to the IAEA—is a small measure already aligned with both countries’ current CBM activities. Multipolar challenges in the second nuclear age require multilateral solutions. Voluntary “gift baskets” offered by states at the four NSSs to build confidence and address lax nuclear-material security accomplished critical first steps towards the yet distant goal of comprehensive global security over fissile-material stockpiles. A nuclearized Asia presents new challenges and opportunities to the global nuclear order. Multilateral nuclear CBMs without Indian and Pakistani participation fall short of their potential to have meaningful global impact. Ultimately, nuclear security is a shared global concern. India and Pakistan, together with nuclear-armed and nuclear-energy states around the world, are already committed to addressing nuclear-security challenges. Building trust among nuclear states on fissile-material management is a key aspect of addressing these challenges. Civilian materials already under international safeguards are a good starting point. Plutonium management requires more early-stage diplomatic efforts, particularly given the focus on HEU by initiatives like the NSSs. [xvi] Effective efforts to tackle the uncertain future of arms control and nuclear-security challenges require NPT member states to consider and include non-NPT members in discussions. Simultaneously, nuclear-armed states outside of the NPT could where useful and within the bounds of national sovereignty choose to participate in CBMs that strengthen norms of responsible nuclear stewardship. Remaining outside the mainstream global nuclear order on such mechanisms not only weakens international security, but also national economic and security interests. In South Asia, there is precedence for voluntary information-sharing mechanisms about sensitive issues like nuclear-materials management. Examples include bilateral Indian and Pakistani agreements to reduce risks related to nuclear accidents; refrain from attacking nuclear facilities; and ban chemical weapons. [xvii] Indian and Pakistani participation in INFCIRC/549 would involve low-cost decisions with the potential to help yield key political, economic, and security benefits. There is support for South Asian participation among participating states. The mechanism is voluntary and customizable. Participation poses no risks and could be very limited, such as Pakistan declaring no separated civilian Pu stocks. Further, INFCIRC/549 has the flexibility to be developed into a broader forum to facilitate more routine communication between the world’s nuclear states regarding fissile-materials management, including discussion of expanding such confidence-building initiatives in the future. [xviii] Indian and Pakistani INFCIRC/549 declarations could easily accomplish minor, but meaningful, gradual and pragmatic steps towards ideal objectives. All serious arms control began with initially small, voluntary diplomatic offerings. In the near term, these small steps help cultivate and maintain globally normative standards for safe and secure nuclear stewardship. Hannah Haegeland is an analyst in the Stimson Center’s South Asia Program. Her co-edited volume, Investigating Crises: South Asia’s Lessons, Evolving Dynamics, and Trajectories, was recently published by Stimson and is available at crises.stimson.org. Haegeland’s research focuses on strategic culture, nuclear security, crisis prevention, onset, escalation, and management, and regional politics in Southern Asia. [i] This essay was made possible in part by the Carnegie Corporation of New York. The statements made and views expressed are solely the responsibility of the author. [ii] Cindy Vestergaard and Sharon Squassoni, “Charting Nuclear Security Progress in South Asia,” Policy Perspectives, Center for Strategic and International Studies, December 1, 2017, available at https://www.stimson.org/content/charting-nuclear-security-progress-south-asia. Vestergaard and Squassoni cite the history of information-sharing in their proposal for South Asia participation in measures like INFCIRC/549. [iv] “History,” Nuclear Security Summit, accessed July 20, 2018, http://www.nss2016.org/about-nss/history/. [v] “Communication Received from Certain Member States Concerning their Policies Regarding the Management of Plutonium (INFCIRC/549),” International Atomic Energy Agency (IAEA), March 16, 1998, available at https://www.iaea.org/sites/default/files/infcirc549.pdf. [vii] For more on the idea of expanding INFCIRC/549 to become a regular forum/working group/committee for discussion and perhaps even “cooperation or policy coordination,” see: John Carlson, Mitigating Security Risks from Separated Plutonium: Some Near-Term Steps (Washington, DC: Nuclear Threat Initiative, 2018), 11-12, http://www.nti.org/media/documents/NTI_Paper_Mitigating_Security_Risks_FINAL-April2018.pdf#page=13. Also see the background history and expansion proposals in, “The International Plutonium Guidelines,” in Global Fissile Material Report 2013: Increasing Transparency of Nuclear Warhead and Fissile Material Stocks as a Step toward Disarmament (Princeton, NJ: International Panel on Fissile Materials and Princeton University, 2013), 71-81. [viii] Table by Eyal Hanfling, a Research Assistant in the Stimson Center South Asia Program. [ix] The information in the table was collected from notes verbales and letters submitted by participating INFCIRC/549 states to IAEA and made publicly available by the IAEA online. A country is marked as having reported for a given year if it submitted an information circular that included annual figures from December of that year. Sometimes, countries reported holdings retroactively for multiple years. There are a number of inconsistencies and irregularities which may explain gaps in reporting— Belgium did not follow the traditional reporting structure in 1998; China, France, and the U.K. did not report on stocks from 1997, and Germany and Switzerland did not report on their stocks from 1996. “Communication Received from Certain Member States Concerning Their Policies Regarding the Management of Plutonium,” International Atomic Energy Agency (IAEA), accessed June 20, 2018, https://www.iaea.org/publications/documents/infcircs/communication-received-certain-member-states-concerning-their-policies-regarding-management-plutonium. Only the United States has reported on plutonium declared “as excess to national security needs” (United States, INFCIRC/549/Add.6/20, October 12, 2017). The original information circular, INFCIRC/549, contains a section titled “Guidelines for the Management of Plutonium,” which is used to classify the different reporting types for the purposes of this table. “Communication Received from Certain Member States Concerning their Policies Regarding the Management of Plutonium, (INFCIRC/549),” International Atomic Energy Agency (IAEA), March 16, 1998, https://www.iaea.org/sites/default/files/infcirc549.pdf. For an introduction to civil plutonium stocks, see: David Albright, Serena Kelleher-Vergantini, and Daniel Schnur, “Civil Plutonium Stocks Worldwide End of 2014,” Institute for Science and International Security, November 16, 2015, https://isis-online.org/uploads/isis-reports/documents/Civil_Plutonium_Stocks_Worldwide_November_16_2015_FINAL.pdf. Russia only reported unirradiated separated plutonium in product stores at reprocessing plants. Reported HEU materials are divided into the following categories: HEU in enrichment plants, HEU at fabricating plants/processing facilities, HEU at civil reactors, HEU at other locations (e.g., laboratories), and HEU (irradiated) at civil reactors. Only the United Kingdom also reports on civil depleted, natural, and low enriched uranium (DNLEU) in the civil nuclear fuel cycle. [x] See China, INFCIRC/549/Add.7, 31 March, 1998; Germany, INFCIRC/549/Add.2, 31 March, 1998; Japan, INFCIRC/549/Add.1, 31 March, 1998; United Kingdom, INFCIRC/549/Add.8, 31 March, 1998; France, INFCIRC/549/Add.5a, 6 April, 1998; Russia, INFCIRC/549/Add.9, 11 November, 1998; Switzerland, INFCIRC/549/Add.4, 31 March, 1998; Belgium, INFCIRC/549/Add.3, 31 March, 1998; United States, INFCIRC/549/Add.6, 31 March, 1998. Belgium, Russia, Switzerland, and the United States have all submitted more than one strategy and planning declaration. [xi] Michael Krepon, Khurshid Khoja, Michael Newbill, and Jenny S. Drezin, eds., A Handbook of Confidence-Building Measures for Regional Security, 3rd Edition (Washington, DC: The Stimson Center, 1998), https://www.stimson.org/content/handbook-confidence-building-measures-regional-security-3rd-edition. [xiii] “The International Plutonium Guidelines,” 75. 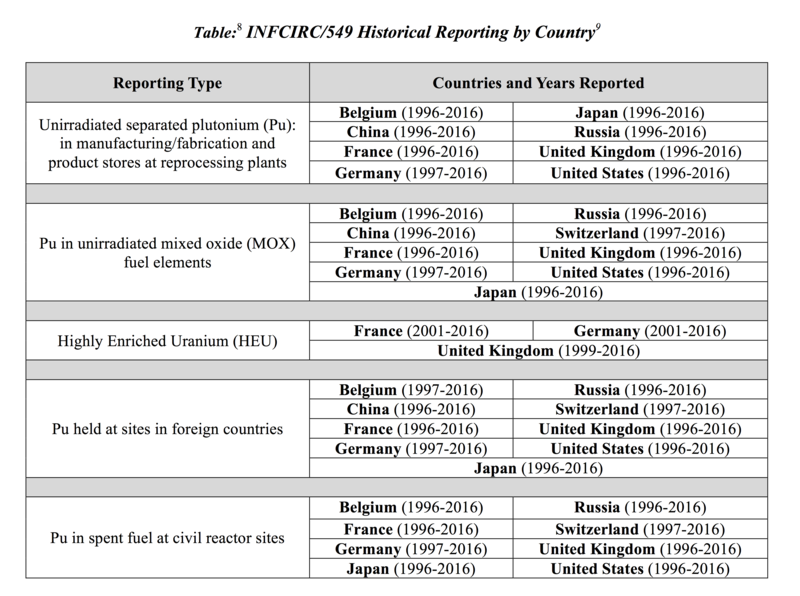 [xiv] Alexander Glaser and Zia Mian, “Global Fissile Material Report: Nuclear Weapon and Fissile Material Stockpiles and Production,” International Panel on Fissile Materials, May 2015, http://fissilematerials.org/library/gfmr15.pdf. [xvii] “Agreement on the Prohibition of Attack against Nuclear Installations and Facilities between the Republic of India and the Islamic Republic of Pakistan,” 1988, available at: http://mea.gov.in/Portal/LegalTreatiesDoc/PAB1232.pdf; Agreement On Reducing The Risk From Accidents Relating To Nuclear Weapons, 21 February, 2007, available at: http://mea.gov.in/Portal/LegalTreatiesDoc/PA07B0425.pdf; “India-Pakistan Agreement on Chemical Weapons,” 1992, available at: http://www.nti.org/media/pdfs/aptindpakch.pdf. This bilateral agreement was signed the year before the international Chemical Weapons Convention was opened for signature. [xviii] For additional discussion fleshing out global, Indian, and Pakistani opinions on whether or not South Asian participation in INFCIRC/549 would be productive and feasible, see the South Asian Voices roundtable, “Multilateral Nuclear Information- Sharing: The View from South Asia,” available at https://southasianvoices.org/multilateral-nuclear-information-sharing-view-south-asia/. Essays include: Muhammad Faisal, “Voluntary Information Sharing on Civilian Plutonium: A Perspective from Pakistan,” South Asian Voices, March 21, 2018; Maimuna Ashraf, “Prospects for Civilian Plutonium Management in Pakistan and South Asia,” South Asian Voices, March 22, 2018; Hina Pandey, “India’s Reservations About Voluntary Reporting of Civilian Plutonium Stocks,” South Asian Voices, March 23, 2018; Pooja Bhatt, “Guidelines for the Management of Plutonium: India’s Case,” South Asian Voices, March 27, 2018; and Sharon Squassoni and Cindy Vestergaard, “Benefits and Challenges of Nuclear Information-Sharing in South Asia,” South Asian Voices, April 13, 2018.